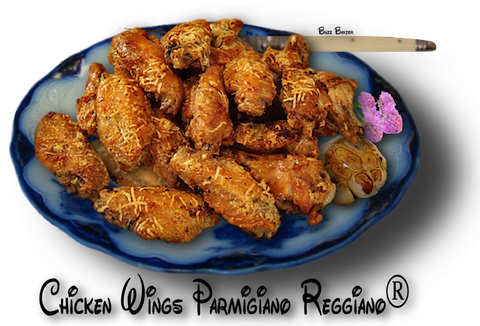 Made with the best Parmesan cheese on Earth, resulting in one of the the best tasting wings you will ever try. 1. Cut chicken wings at joints; discard small ends or use for stock. 2. Combine cheese, flour and seasonings in plastic bag. 3. Dip chicken in buttermilk. 4. Add several pieces at a time to cheese mixture; shake to coat. Place in greased jelly roll pan. 5. Combine the melted butter and roasted garlic together. Pour the mixture over chicken. Bake at 400℉ for 20 minutes. 6. Turn chicken over; continue cooking 20 - 25 minutes until golden brown.